Rachel Pfeffer crafts this pendant with 14k gold-plated brass and a shimmering opal. 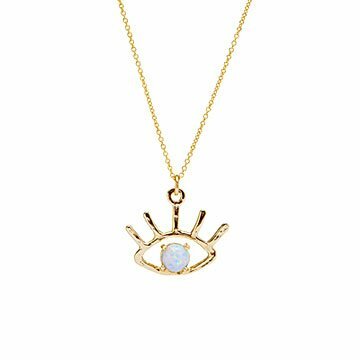 The eye is a symbol of protection in some of our world's oldest cultures, and we could all use a little of that when we walk out the door each day. Rachel Pfeffer crafts this pendant with 14k gold-plated brass and a shimmering opal. Playful and delicate, it's a piece you can layer with other necklaces, or wear alone for a simpler, ahem, look. Handmade in Washington D.C.